Natural Care is an ISO 9001:2008 certified company & is headquartered in Mumbai, India. Currently we are having tie ups with more than 10 International companies & we are serving in more than 100 cities across 25 states in India in a full range of products. Our marketing team comprises of about 100 plus independent sales agents. Our infrastructure, skills and resources are at par with the best in the world. Kai Natural Care is the leading provider of Unique Natural Healthcare Drops, Exotic Juices, Weight Management Products, 100% Organic Products, Organic Agricultural Products, Unique Wellness Products, 100% Ayurvedic Products, Anti Radiation Range of products, Biomagnetic products. We have introduced first time in India an excellent product Turmeric Supreme Capsules. It is a HALAL & Kosher certified. It is 100% natural product produced under GMP guidelines. 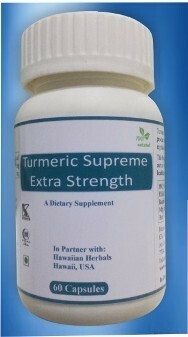 Turmeric Supreme represents full Curcumin Synergy. Our unique formulation creates a powerful whole plant profile of Turmeric's valuable properties. It can support a healthy inflammatory response. Black Pepper extract aids in absorption of curcumin. It contains 100% natural herbal extracts that relieves joint pain and swelling and may improve mobility and muscular discomfort for healthy joints. It is helpful in different conditions which can lead to painful joints, including osteoarthritis, rheumatoid arthritis, bursitis, gout, strains, sprains, and other injuries. Alpha R-Lipoic Acid is the only "all-natural" form of Alpha lipoic acid (ALA). Natural Alpha "R"-Lipoic Acid form is the one that contains 100% of the strong, biologically active and antioxidant-enhancing properties that are important for cellular health. Alpha R-Lipoic Acid Tablets is a HALAL & KOSHER certified product & produced under International GMP guidelines. Scientist have discovered that Alpha R-Lipoic Acid or "R-Alpha Lipoic Acid" is the only form of Alpha Lipoic Acid (ALA) in the world that has the proper structural fit for human membrane receptors and enzymes. Because of this natural state and compatibility with the human body, Alpha R Lipoic Acid is metabolized more efficiently and has a much greater potency than unnatural Alpha Lipoic Acid. We have launched Artemisinin Capsules to support gastrointestinal health in technical collaboration with Hawaiian Herbal USA is a HALAL & KOSHER certified product & produced under International GMP guidelines. Artemisinin is a botanical extract from Artemisia Annua used around the world due to its unique qualities to support GI tract health and healthy parasitical control in the body. Recent research has shown that it can destroy malarial parasites, lower fevers and reduce bleeding. It can also support healthy immune responses and skin health. Astragalus Supreme is specially to provide deep-level immune support while assisting the body in adapting to daily stress. It is a HALAL and KOSHER certified product and produced under international GMP guidelines. Herbs incorporated in this formula work together to encourage overall immune system health, stamina, and endurance to physical and emotional stress. Astragalus Supreme also provides antioxidant protection to cells and tissues. Passionflower Capsules is a HALAL & Kosher certified product. It is 100% natural product produced under international GMP guidelines. Passionflower has been used traditionally for thousands of years to promote calm and relieve restlessness and as a nutritive tonic for the nervous system. Sourced from premium quality herb, Passion flower extract can help to reduce stress, fatigue, restlessness, nervousness and insomnia. Liv Yogiani, is launched to support the body to maintain healthy liver function. It is 100% natural product and without any side effects. It is HALAL and Kosher certified product and has been produced under international GMP guidelines. Natural liver balancing herbs found in this unique formula can promote liver micro circulation, immune stimulation and provide strong liver protection. It can help in liver detoxification and maintain healthy liver function and prevent from many liver problems such as hepatitis A, B, or C, jaundice, cirrhosis, alcohol-induced fatty liver and autoimmune liver disorders. Oil of Oregano Softgels is a superior herbal product designed to support healthy digestive flora and a healthy immune response. This specific formulation has been developed, tested, and implemented by team eminent scientists through their extensive anecdotal research. A natural antioxidant source, Oil of Oregano contains phytochemical which support the body’s natural resistance. It can help support a healthy microbial environment in the intestines, support healthy digestive flora and a healthy immune system functioning. Enriched with powerful Antioxidant and Antiageing nutrients Skin, Nails & Hair Capsules is designed to support skin, nails and hair strength. It is a whole food multivitamin & mineral dietary product that helps to nourish, strengthen and grow skin, nails and hair. Valerian Root Extract Capsules contains Valerian root extract (Valeriana officinalis) standardized to contain 1.8 mg Valerenic acid derivatives. It is 100% natural product and without any side effects. It is HALAL and Kosher certified product and has been produced under international GMP regulation. Valerian root has long been used to promote deep and restful sleep in those with occasional sleeplessness. By promoting a sense of calm and relaxation, Valerian Root supports the body in falling asleep naturally. Ashwagandha Root Extract Capsules is first time launched in India in technical collaboration with Hawaiian Herbals, Hawaii USA to support healthy adrenal functioning. It is 100% natural, HALAL & Kosher certified product and has been produced under international GMP guidelines. Stress is at the heart of many health conditions. When the body is stressed, your capacity to adapt is reduced, which can wreak havoc on the immune, nervous and inflammatory pathways. Optimizing adrenal gland function is essential to combating stress. Enriched with many adaptogenic herbs Adrenal Health provides nourishment to the adrenals, enabling the body to adapt to stress in a healthy way. Bio-Zyme is a digestive enzyme product with natural digestive enzymes, launched in technical collaboration with Hawaiian Herbals, Hawaii USA. It is 100% natural product and without any side effects. Bio-Zyme systemic enzymes provide a high potency pancreatic enzyme complex to support healthy digestion of fats, carbohydrates, and proteins. While other pancreatin products are often diluted with salt or lactose, Bio-Zyme systemic enzymes contains a full-strength pancreatic extract for optimum digestive support. Bio-Zyme systemic enzymes help reduce gas, bloating and fullness after eating. Maintaining normal levels of cholesterol is essential for a healthy heart and long life. Cholesterol Maintenance Capsules is an excellent dietary product designed to maintain cholesterol levels already within a healthy range, and provide potent antioxidant protection. It is a HALAL and KOSHER certified product produced under international GMP guidelines. Many people struggle to reach their optimal weight. Diet Slim designed in technical collaboration with Hawaiian herbals, Hawaii, USA to promote healthy body weight. This is HALAL & Kosher acclaimed product and produced under GMP guidelines. It can support the body’s ability to metabolize additional calories, particularly when used as part of a reduced calorie diet. It can help to maintain the body’s energy levels and promote a healthy thermogenic response. Energy Vitality Capsules is very effective product first time launched in India in technical collaboration with Hawaiian Herbals, Hawaii USA. It is sourced from the highest-quality herbs and concentrated by 100% natural processes. It is HALAL & Kosher certified and has been produced under international GMP guidelines. In order to feel consistent energy, the body must be able to adapt to daily stressors. Energy Vitality helps promote energy and stamina with wonderful herbs such as Ginseng and Schisandra, which enable the body to adapt to stress in a healthy way. In addition, certified organic Green Tea and Ginkgo offer antioxidant support that helps protect the body from free radical damage. Supporting optimal functioning of the organs of elimination, such as the kidneys and liver, is essential for overall health. Herbal Diuretic is designed and formulated with Hawaiian Herbals, USA to gently support the healthy excretion of fluid waste from the kidneys, helping them function more efficiently. It is a HALAL and KOSHER certified product and produced under international GMP guidelines. Alisma Capsules is very effective product first time launched in India to support healthy kidney function. It is sourced from the highest-quality herbs and concentrated by 100% natural processes. These are formulated using natural extracts and are highly admired for side effect free feature. Moreover, Alisma Capsule is HALAL & Kosher certified and has been produced under international GMP guidelines. Alisma herb has been used for centuries in Asia and in Eastern Medicine due to its health supportive characteristics such as kidney function, healthy urinary function and healthy kidney filtration. This Alisma herbal product is a high quality, concentrated extract made from the natural Alisma Plantago Rhizoma herb which can support healthy renal function. Calm Ezz is a stress reliever dietary product with natural botanical ingredients, launched in India. It is 100% natural product and without any side effects. It is HALAL and Kosher certified product and has been produced under international GMP guidelines. Canox is a proprietary blend formulated to support healthy energy and age related health. It is 100% natural product and without any side effects. It is HALAL and Kosher certified product and has been produced under international GMP guidelines. As we age our body’s abilities to defend against illness, free radicals and the onslaught of toxins diminish. This means that we feel sick more often, have less energy and suffer with overall poor health. Blend of exotic health giving herbs in Canox Capsules can offer a potent array of nutrients that replenish the immune system, optimize actions and empower a new level of defense tools for optimal wellness. Healthy Prostate & Ovary Capsules can help to promote healthy prostate, ovarian and immune function. It can provide overall balance for the body and key organs that are in involved with maintaining prostate glandular tissue and prostate function. It is 100% natural product and without any side effects. It is HALAL and Kosher certified product and has been produced under international GMP guidelines. Liver Well Capsules is 100% natural product and without any side effects. It is HALAL and Kosher certified product and has been produced under international GMP guidelines. Resveratrol Ultra capsules is 100% natural product and without any side effects. It is HALAL and Kosher certified product and has been produced under international GMP guidelines. Resveratrol is a powerful antioxidant that is produced by some plants to protect against environmental stresses. Resveratrol can help to support the prevention of cell damage caused by free radicals and prevent from many dreadful diseases. Rutin contains Quercetin, an antioxidant shown to reduce inflammation and offer a range of health benefits. Researches around the world claim that Rutin products can help treat certain health conditions by strengthening the blood vessels. We have launched a new product in India to support healthy intestinal and digestive health, Rhubarb Capsules, in joint venture with Hawaiian Herbals, USA. Rhubarb Root has been used in traditional Chinese medicine for its therapeutic action and to assist the body for conditions of constipation, abdominal pain due to indigestion, diarrhea and dysentery. It can also help to relax the bowels and remove toxic substances form the body. Rhubarb Capsules can promote improved intestinal and bowel health and help to maintain bowel regularity. Ashwagandha Root Extract Capsules is first time launched in India. It is 100% natural, HALAL & Kosher certified product and has been produced under international GMP guidelines. When the body is stressed, the immune and nervous systems can be affected, leaving a person depleted. Adaptogenic herbs such as Ashwagandha Root help nourish and restore optimal nervous and immune system health by normalizing mood, energy levels, and overall immune function. Ashwagandha has powerful antioxidant properties that seek and destroy the free radicals that have been implicated in aging and numerous disease states. Even more remarkable, emerging evidence suggests that Ashwagandha has anti-cancer benefits as well. Cinnamon Bark Capsules is a HALAL & Kosher certified product. It is 100% natural product produced under international GMP guidelines. Cinnamon bark helps support a healthy glycemic balance by supporting healthy blood sugar metabolism. Kai Natural care uses dual extraction technology to deliver the broadest spectrum of herbal constituents for better results. Hiactives Tart Cherry Capsules is a dietary product 100% natural product and without any side effects. It is HALAL and Kosher certified product and has been produced under international GMP guidelines. Tart cherries are loaded with important phytonutrients like antioxidants and anti-inflammatory agents which can offer protection against a host of other conditions. The natural Anthocyanins and Flavonoids found in cherries can provide powerful antioxidant protection for the healthy cardiovascular system, ensure proper nerve function and offer anti-cancer properties. By strengthening vital collagen structures in connective tissues and helping to metabolize uric acid, it can also support joint health as well. We have launched an excellent product Berberine capsules for maintaining healthy blood glucose and cholesterol levels in joint venture with Hawaiian Herbals, USA. It is 100% natural product and without any side effects. It is HALAL and Kosher certified product and has been produced under international GMP guidelines. Berberine has been used in virtually all traditional medical systems including Ayurvedic, Vietnamese, and Chinese medicine for more than 3000 years. Researchers have found that Berberine may be beneficial for maintaining healthy blood glucose and cholesterol levels. Various studies showed an improvement in long-term blood sugar control and a significant reduction in total LDL (bad) cholesterol levels. Black Cumin Seed oil Capsules is very effective product sourced from the highest-quality and authentic sources and concentrated by 100% natural processes. This Black Seed Oil product contains 100% pure Black Cumin Seed oil. Scientific research around the world shows that Black Seed Oil contains more than 100 natural synergistic health characteristics. It is a rich source of unsaturated essential fatty acids and other essential nutrients which can support intestinal, respiratory and digestive health. The high content of phytosterols found in Black Cumin Oil are also necessary for the human body for natural production of hormones, provitamin D and bile acid aiding in a prevention of endocrine disorders, immune deficiency and cardiovascular disease. As a result, these tiny Black Cumin seeds can provide an all-around super multi-vitamin of nutrition. We bring the most advanced mass-promoting health product, Bodymax Ayurvedic Capsules formulated using natural extracts of various medicinal plants and are highly admired for side effect free feature. It is a scientifically driven advanced weight gain formulation with a highly potent blend of amino acids packed sources of protein. Enriched with superior quality easily absorbable protein Bodymax Ayurvedic capsules can help delivering muscle boosting nutrients to muscles which can lead to jack up the size and strength fast. It can also increase the efficiency of body against physical fatigue and can help in body building. EFA Complex contains an essential fatty acid (EFA) complex comprised of 75% plant sourced ingredients and 25% fish sourced for a full spectrum EFA option. DiabX Capsules is HALAL and Kosher certified product and has been produced under international GMP guidelines. It is 100% natural & most concentrated source of Gymnema sylvestrae. Gymnema has a long history of use in Indian Ayurvedic medicine. Its hindi name is Gurmar which means "destroyer of sugar”. DiabX Capsules can be helpful in diabetes and other metabolic syndrome. Glucosamine HCl is HALAL & Kosher acclaimed product and produced under GMP guidelines. Glucosamine is a naturally occurring substance found in the fluid around our joints. It is naturally present in animal bones, bone marrow, shellfish and fungi. As per many clinical trials, Glucosamine works as a stimulant and precursor to the proteins that form cartilage. Genecel Capsules is a dietary product HALAL and Kosher certified and produced under international GMP guidelines. Genecel provides a powerful synergistic blend of cellular supporting herbal ingredients which have been carefully chosen and uniquely formulated to provide maximum support for healthy cellular replication, repair and growth. This formula can be used be any individual as a dietary product to support healthy balance and detoxification or for those with an interest on supporting chronic and age-related situations that are associated with impaired cell function or extreme toxicity. Glucosamine KCl is one of the most popular nutritional products in the world, this is HALAL & Kosher acclaimed product and produced under GMP guidelines. Glucosamine-sulphate has been used for supporting the physiological function of cartilage, joint and connective tissues. It provides better physiological support than glucosamine hydrochloride and it also does not need other substances [such as chondroitin or methylsulfonylmethane (MSM)] for this effect. Krill Oil Softgel is HALAL & Kosher acclaimed product and produced under GMP guidelines. Krill oil is a fantastic new way to renew your health, feel better in your day-to-day life and live a happier, healthier life knowing you are protected and safe. Krill oil, like fish oil, contains omega-3 fats such as eicosapentanoic acid (EPA) and docosahexanoic acid (DHA). However, in fish oil, these omega-3 fats are found in the triglyceride form. In krill oil, they are found in a double-chain phospholipid structure. The fats in human cell walls are in the phospholipid form. The phospholipid structure of the EPA and DHA in krill oil makes them much more absorbable. Krill oil also contains vitamin E, vitamin A, vitamin D, and astaxanthin, which is a potent antioxidant. WE have launched a new product in India, L- Carnosine, in technical collaboration with Hawaiian Herbals, Hawaii USA. It is 100% natural product and without any side effects. Carnosine is a protein building block that is naturally produced in the body. It is concentrated in muscles when they are working, and it is also found in the heart, brain, and many other parts of the body. Scientific studies suggest that L-Carnosine has excellent anti-oxidant, anti-aging and neuroprotective capacities. It can support healthy brain function, can prevent from liver disease, heart problems, cataracts, Alzheimer's disease, and cancer. Ocular Defense Formula is HALAL and Kosher certified product and has been produced under GMP guidelines. Ocular Defense Formula combines lutein which supports eye health during aging, with antioxidant Vitamins A (as beta-carotene), C and E which can provide nutrition for the eye and help support healthy vision. We have launched Black Cohosh Capsules to support healthy women reproductive system in technical collaboration with Hawaiian Herbal USA. It is a HALAL & KOSHER certified product & produced under International GMP guidelines. Black Cohosh has a long history of use, now backed by scientific evidence, for helping support a healthy female reproductive system. Black Cohosh can help support a woman's body during natural transitional hormonal states.